The hotel houses 168 rooms & suites. 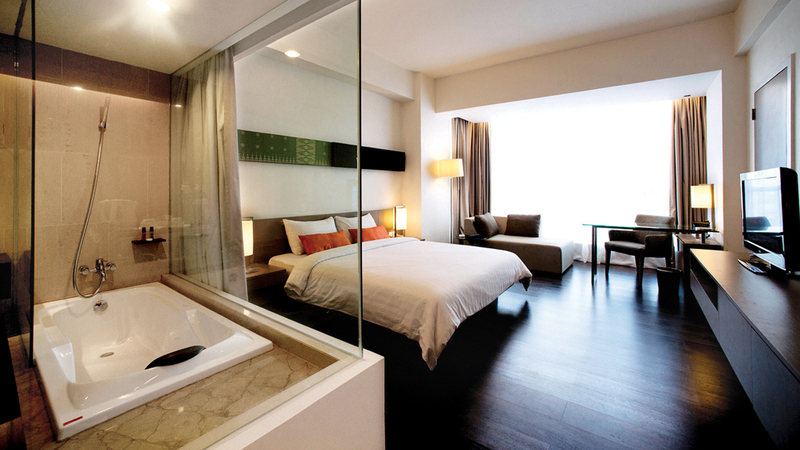 All rooms are modern design, combining simplicity with exceptional comfort and convenience. All suites feature a separate living area, a spacious work desk, a large bathroom with bathtub, and are complemented by Wi Fi, Telephone units both in room and bath room with IDD access, 32 and 42 inch flat screen TV cable and mini bar. The Spa and fitness centre by De Vata. Located on level 5 by the hydro pool, is a pool bar serving healthy beverages, ranging from freshly squeezed juices to herbal tea. 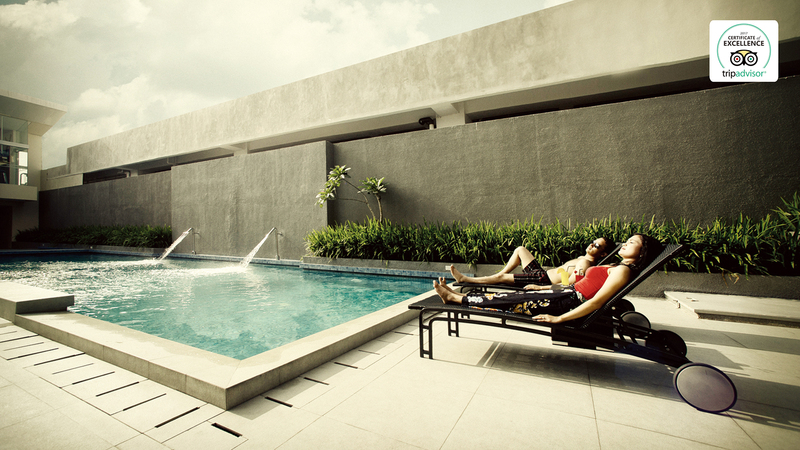 The facilities also include a swimming pool, sauna and whirlpool with relaxation areas. 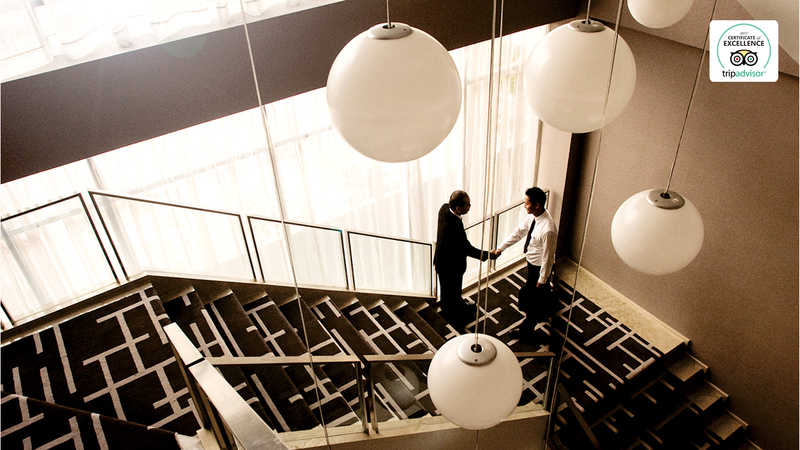 The hotel offers 1 business centre, 11 meeting rooms and a ballroom, The Premiere Ballroom. accommodating between 20 to 2500 guests for a variety of occasions. 24 hours. Step into our cosmopolitan café restaurant on the lobby floor and enjoy its thriving atmosphere. Where you can enjoy casual dining throughout the day in a spacious naturally lit setting or dine exclusively with your guest at night. Serving extensive range of dishes, ranging from local delights to international dishes, all prepared and helmed by our Head Chef; a 5 times winner of a national television cooking competition with extensive experience from all round the world. Located on level 2, overlooking the panoramic view of Jalan Jenderal Sudirman, this is where you’ll find elegantly set contemporary lounge with wine cellar and cigar room, created for sophisticated crowd of Pekanbaru. Soak up the atmosphere, recharge after a busy day, or even just chill with our live music entertainment. Private lounge for those who prefer a more intimate setting with a group of friends is also available. 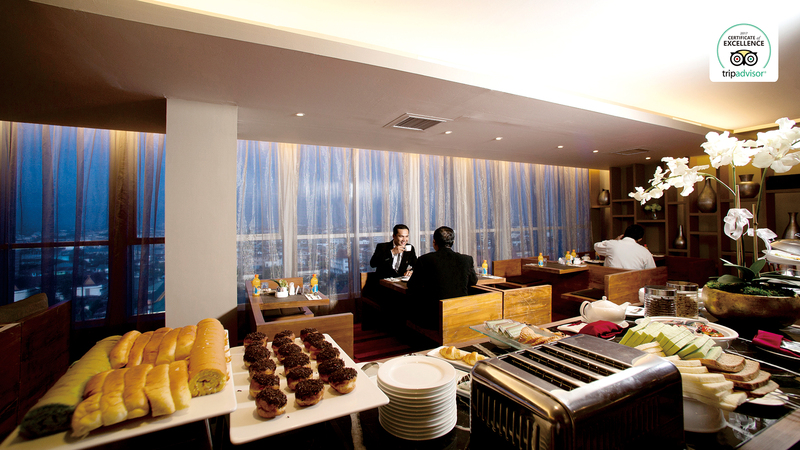 Exclusively prepared for those staying in our executive floor is this private club lounge, located on level 12. Breakfast, tea time, or finger food will be served throughout the day for the enjoyment and convenience of our executive floor guest. we are located in heart of the city, just a mere 15 minutes from Sultan Syarif Kasim II International Airport and strategically located amongst governmental buildings and major office buildings.